About The Book How long does it really take for a broken heart to heal completely? Is there always that special someone you love, but can't ever have? The One You Cannot Have is a story that tries to answer these difficult questions that affect each one of us, at some point of time in life. Anjali knows that the only person she can ever want is Aman, while he knows that the only one for him is Shruti. Aman and Shruti had once been so deeply in love that they thought it would last forever. But that's when things changed drastically. Shruti leaves Aman and decides to get married to Rishabh, leaving Aman devastated. Aman then decides to leave the country in an attempt to start life anew and forget all about his love, Shruti. He then returns and is confronted with the major decision concerning starting a new life with Anjali. Will he be able to ever move on from his true love, Shruti? Will life with Anjali be a happy one? Published on 17th November 2013, The One You Cannot Have is available in paperback. It tells a story that will be relatable for many: that of unrequited love and moving on when things turn ugly. Key Features The story has relatable characters, namely Aman, Anjali and Shruti. The storyline is interesting, which is why the readers find themselves gripped till the very end of the book. 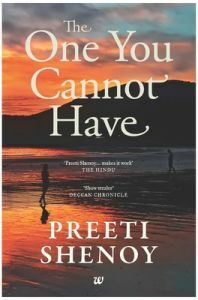 About the Author: The author of the book The One You Cannot Have, Preeti Shenoy is a well-known, bestselling author and artist. Even though she has several academic qualifications to her credit, she believes in the fact that life is the best teacher that you can ever have. Preeti believes in spending quality time with her family, including her dog. She is also a keen blogger, yoga enthusiast and nature lover as well. She enjoys travelling to various new places too. Preeti Shenoy resides in Bangalore, India, at present. by Piyush, just 18 years old, is a student. He loves reading love stories, something like what he has written himself. He wants to become the best writer in the world. My Childhood Love is his debut novel. Some thoughts from his mind: Friend said to not take risks but I said I don't take the chance to avoid risks I do not think who I am. I just thought what am I? I love myself but I am not a selfish person. I don't care who talks about me but I care who does not talk about me.